The team at TR Scotland is rounding off a year of charitable support for local food banks with a food and toy drive to benefit underprivileged families and individuals this Christmas. TR Scotland has already completed three very successful food drives during the year to collect and deliver donations to food banks in their community, of which there are sadly a considerable number. The drives were started earlier in 2018 as a result of discussions held by the site’s ‘Continuous Improvement Team’, who meet every two months to discuss ideas to improve culture, team work and the office environment. The team decided that a quarterly food drive would be an ideal way for TR Scotland employees to come together and give something back to the local community. For the Christmas drive, the team collected enough items to be able to donate twelve large boxes of food and nine large boxes of toys to local donation banks. Each toy was gift wrapped and labelled according to the age or gender they were suitable for. The Food banks were extremely impressed with and grateful for the donations and have expressed their thanks to all at TR Scotland who participated in the drives. “It’s a sad fact that in our local area, many families and individuals are not able to provide for themselves and their loved ones and rely on local food banks to ensure they have enough to eat. It doesn’t take much to donate a few items each once a quarter and it really does make such a difference to those in need. On Friday 26th October, employees at the Scottish division of global fasteners engineer, manufacturer and distributor TR Fastenings, held a coffee morning in aid of Macmillan Cancer Support raising a total of £214.00. 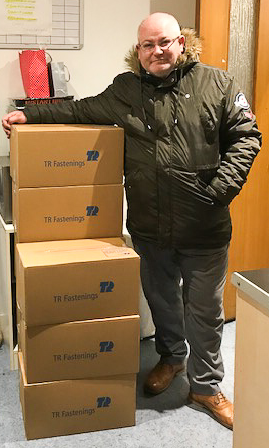 The staff at TR Fastenings Scotland have been busy getting together eight boxes full of goodies to donate to their local food bank. Loaves and Fishes, a Glasgow based charity that supports people in need, depends entirely on the generous donations of individuals, organisations and companies to provide people with a sit down meal, food parcels, clothes and toiletries. Denis Curran MBE, Chairman of Loaves and Fishes, added: “Thank you very much for your support which is much needed, everything you donated was ideal."